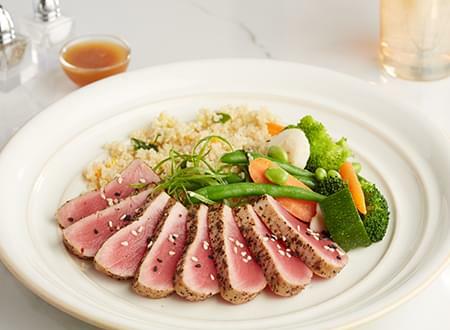 THIS ENTREE SHOULD BE SERVED AT ROOM TEMPERATURE: Remove Ahi Tuna from Tray onto a separate dish, place aside. Heat remaining items in microwave according to label instructions for up to 2:00 minutes. Check temperature and heat in additional 30 second increments until at least 160 degrees. Plate by placing cooked items onto the plate and placing the Cool Ahi Tuna on top.